It all stemmed from his observation that before preclears could make gains, they had to be interested in their own cases. Yet what he found is that most people were below any interest—even in life itself. He tracked that down to basic and found the factor of Help was the major factor. Specifically, previous help had so often failed most felt it wasn’t even possible. That’s what led him to develop Presession Processes—so named since they were necessary before any session could even begin—to bring preclears up to the point where they knew help was possible, and were now interested in getting some! Moreover, Mr. Hubbard discovered these same factors could be addressed outside the auditing room and, in fact, were the answer to dissemination itself. Indeed, they not only got anyone interested in Scientology, but—since they are a process—provided case gain even when used in dissemination. Here, then, are two lecture series in one. 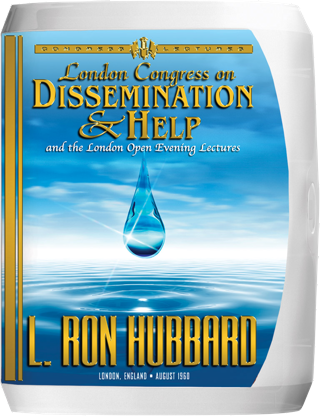 First, he delivered the London Open Evening Lectures, to both Scientologists and their friends—expanding on these factors and, in fact, demonstrating their use in dissemination! Next, to teach their application in both auditing and dissemination, he called together Scientologists for the London Congress on Dissemination & Help. 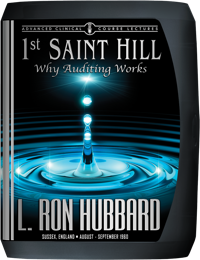 Here, then, are L. Ron Hubbard’s public lectures on bringing Scientology to the world, and the means for you to do the same and so help get the rest of the planet in session. About the only overt act that we could pull now in Scientology is fail to disseminate it properly. It was the summer of 1960, and just one year since Mr. Hubbard’s establishment of Saint Hill as the central headquarters for all research and dissemination. Technology had already advanced by monumental leaps. First with the means for wide scale clearing through co-auditing (Theta Clear Congress). Then with the breakthrough of responsibility and its technology of overts and withholds to advance any case and any dynamic (State of Man Congress). Moreover, with these breakthroughs now in application throughout the world, the Scientology population had doubled in just ten months. Yet what he next discovered was about to signal unprecedented growth. For it was, in fact, the magic formula of dissemination. “Have you ever wondered how to persuade a stranger to get audited? Have you ever had to ‘sell’ a hostile family member Scientology before you could audit someone? Have you ever had trouble auditing anyone? And while L. Ron Hubbard then detailed step-by-step instructions for application of the Deadly Quartet in dissemination, quite literally “How to do it,” nothing could compare to what he next provided. Here, then, are two lecture series in one—both the technology itself and its full use in dissemination. It’s the technology that cuts right to the core of deep-rooted apathy, without which people of Earth might never take their first step to freedom. And that is why this Congress is the key to true planetary help.